Marty Pilletti: You don't like her. My mother don't like her. She's a dog. And I'm a fat, ugly man. Well, all I know is I had a good time last night. I'm gonna have a good time tonight. If we have enough good times together, I'm gonna get down on my knees. I'm gonna beg that girl to marry me. If we make a party on New Year's, I got a date for that party. You don't like her? That's too bad. Q: Is 'Marty' based on a book? Q: Who is this Mickey Spillane the boys keep talking about? Marty Piletti (Ernest Borgnine) is a lonely, insecure and honest thirty-four years old good man, living with his Italian mother, Mrs. Theresa Piletti (Esther Minciotti), and working as a butcher. Angie (Joe Mantell) is his best friend, a very shallow person, and his company to the bars and ballrooms in the evenings, since the ugly and fat Marty is rejected by the girls. His Italian family and friends put pressure on him to get married, but Marty has no girlfriend and lots of difficulties to get close to women. 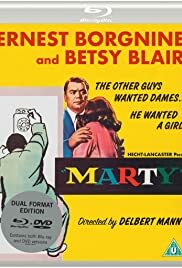 One Saturday night, Marty meets Clara Snyder (Betsy Blair), a twenty-nine single, ugly (obs: `dog', in accordance with the description of Marty's friends in the story, but indeed Betsy Blair was a charming woman, having beautiful eyes and lovely smile and voice) and rejected woman, in a ballroom. Betsy is a teacher in Brooklyn with college degree, and like Marty, is very insecure and has the feeling of rejection by men. They feel attracted by each other and spend a wonderful night together. On the next day, before and after the Sunday Mass, Marty's relatives and friends make jokes with the lack of beauty in Clara. The marvelous open end of the story, uncommon in American movies, is one of the best I have ever seen. This movie is a simple, beautiful and touching love story with magnificent performances of the cast and a sensitive direction. The story and slangs (dog, tomatoes etc.) are dated in 2004, but does not jeopardize the beauty of this delightful romance. `Marty' is the only Best Picture winner (awarded in Picture, Director, Actor and Screenplay and nominated for Supporting Actor, Supporting Actress, Art-Direction and Cinematography) to also win at the Cannes Film Festival. My vote is nine. 105 of 116 people found this review helpful. Was this review helpful to you?